+ HOW TO CREATE YOUR OWN CAPSULE COLLECTION. 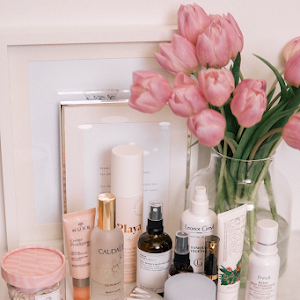 I've had several questions about my own skincare, creating a skincare collection and what I consider to be my must-have products, so today I thought I'd do a big bumper skincare post, and share my thoughts with you. 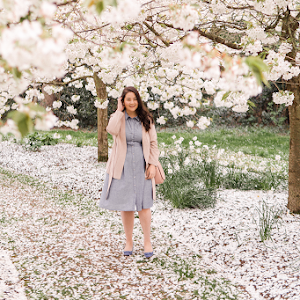 I forewarn you, this is a lengthy lazy Sunday read so grab a bacon sandwich and I'll meet you back here in 10 - hope you enjoy! Let's first disclose that I own a lot of skincare. 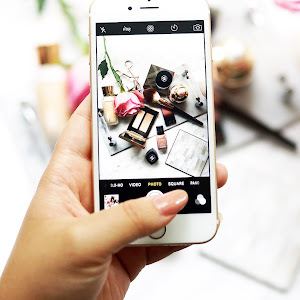 Much more than any person requires (what you see above is just a snippet of course ;) But, possibly because I get to try so much, I'm in fact very selective with what I covet most, what I wear regularly, and what I repurchase time and again. 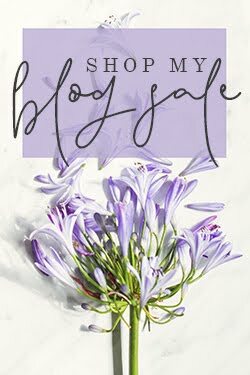 I'm sure I don't need to say, but we don't need these expansive collections, and I hope that my reviews and posts guide you to pick and choose what might be suitable for you, and to create your own personalised collections. 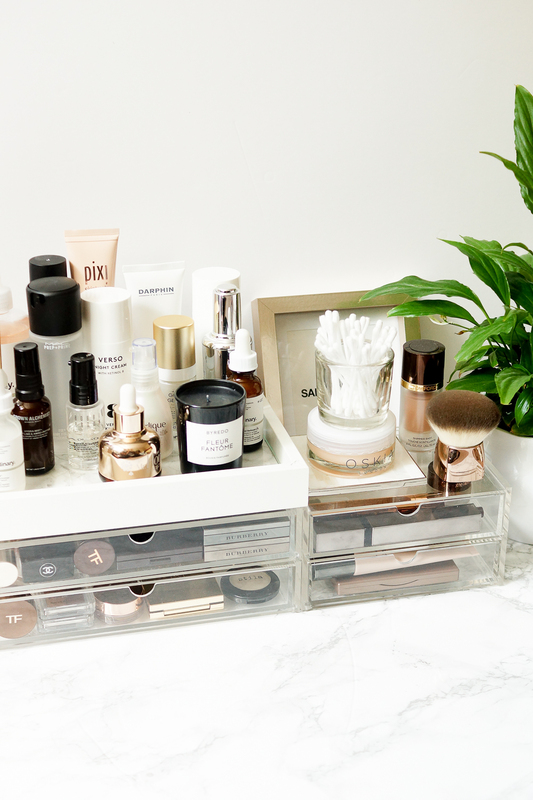 Today, I'm going to be going through my 10 essential elements of skincare for a simple but comprehensive routine (a Goldilocks Skincare Routine if you will!) and share hopefully a handful of favourites for each category, so you have some options. Righto, well enough waffling, let's jump in. - to remove makeup and clean the skin. Everyone knows that removing makeup and thoroughly cleansing your skin are cornerstones to any regime. I like to use a mixture of oily, balmy makeup removers, and micellar waters in my own routine. Of all the cleansing balms I've tried, I most enjoy the Omorovicza one - it's thorough, scent-free and comfortable on the skin. 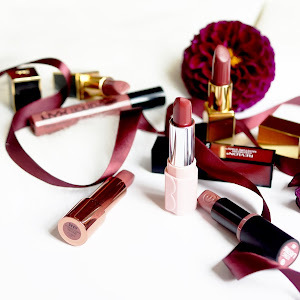 Charlotte Tilbury's balm is gorgeous too, and I love that it's multipurpose. For a liquid, oil cleanser, I'd refer you to this post on anti-aging but I love the Bobbi Brown oil, especially as it comes in a travel size too, this Shu Uemura antioxidant oil, and The History Of Whoo oil, as they feel lovely on my skin and include great ingredients. 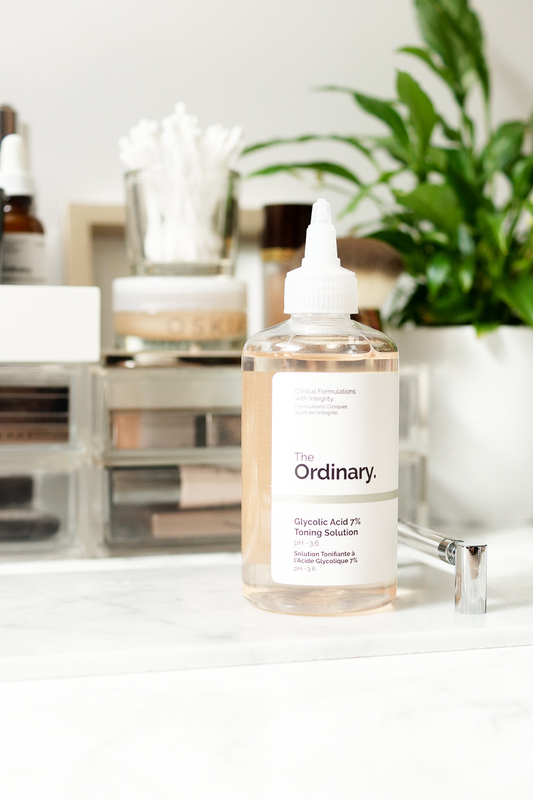 When it comes to micellar waters, I'm quite picky (sorry L'Oreal and Garnier in particular), and I tend to alternate between Bioderma (the blue one) and Simple, as they're easily accessible and I go through micellar waters like, well, water. - to rid dead skin, prevent clogged pores, increase circulation, aid cell turnover, and helps your fancy and expensive serums to penetrate into the skin and give you the results you were hoping for. 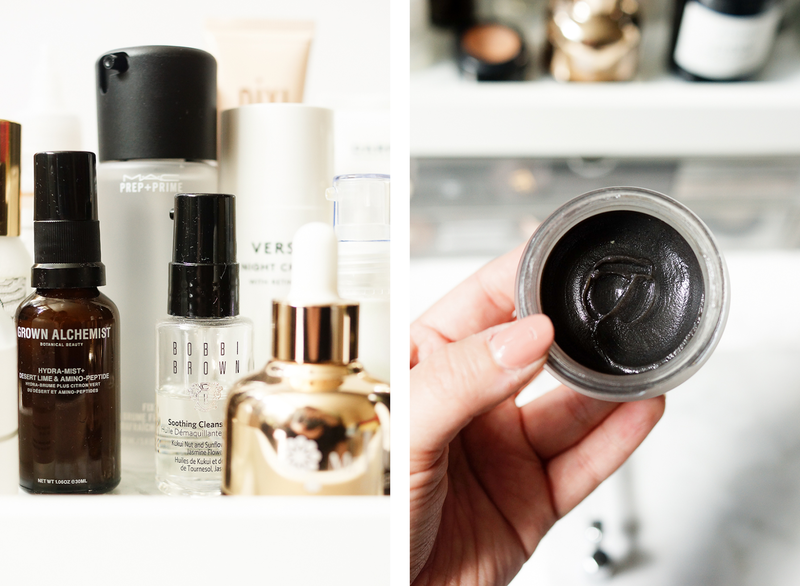 I went through a phase of favouring scrubs, and another of only using chemical exfoliants, but I now like a mixture of both, especially as physical exfoliants have improved so much, so it's quite apt that I have three favourites of each to talk about. Laura Mercier's exfoliator contains little microfoliant particles suspended in a cream to buff away the outer layer of skin. Both Pixi's new-ish lactic acid scrub and the Omorovicza refiner are mask-come-scrubs that eat away at dead skin with fruit enzymes, before you massage them around the face for a bit of a physical polish too. For chemical exfoliants, my old friends, Oskia mask and REN treatment still sit proudly front and centre - I've used them for yonks and they never let me down. The Neogen wine pads are also great, and uber convenient with their little double-sided cushions. I'd say all of the above (in fact all of the cleansers mentioned too) are great for dry to oily skin, and anything in between, especially as they don't stay on the face for long. This is one of the parts of my collection that can go a little wild if I don't keep it tamed and under wraps. 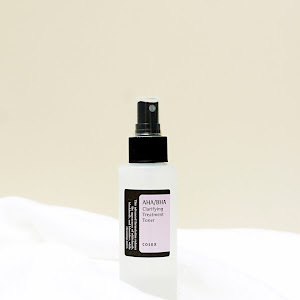 I love a good facial spray, either after cleansing/exfoliating, right before makeup, during the day, at night, whenever is a justified time for me. An old favourite is the Caudalie spray, I love the herbal-y scent and the spray is lovely and wide and fine. Similarly MAC's Fix+, another bottle kindly provided by MAC from my recent event! I love the twist-click-shut lid and simple formula with lots of glycerin and cucumber and whatnot. 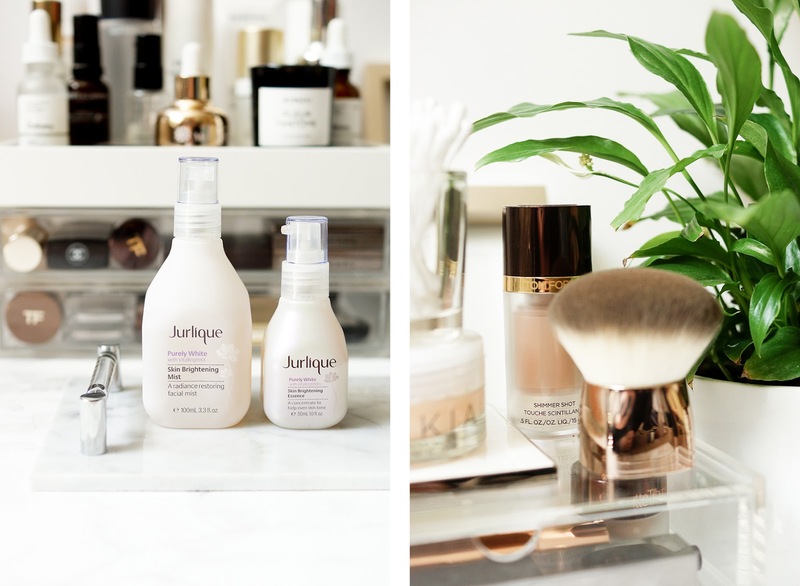 Two slightly newer additions are Jurlique's brightening mist and Troiareuke's Skin Complex Formula, c/o Jurlique and KBeautyBay respectively. The Troiareuke is really hydrating, very moist and plump on the skin, and I love that you can mix in the special ampoules to boost your skincare. (You can read more here if you fancy). The Jurlique is lovely and light and glowy, and I much prefer this edition over the rose one you might have heard of. For a drier skin, Trilogy's mist toner is just gorgeous - it contains quite a few oils to give your skin a glow, and smells divine (I wouldn't advise this for oily skins). 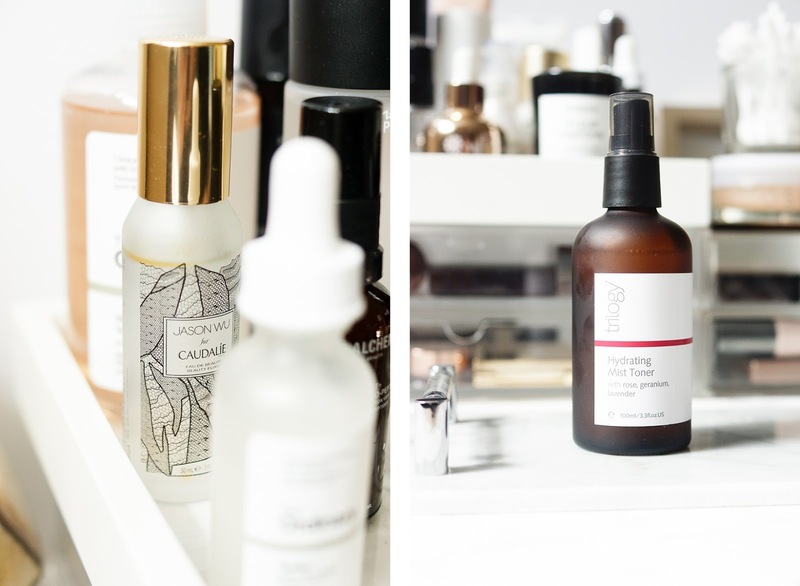 Lastly, I couldn't not talk about two of my favourite bottle toners - the IOPE Moistgen, and Whamisa flowers toner (c/o Buttermilk Skincare). Both are fairly similar products, that provide that delicious suppleness and bounce to the skin that keeps it looking plump and youthful. - to nourish, soothe, treat and replenish. I couldn't be half Korean and not love sheet masks. I've said before but I've five favourites - the Whamisa flowers sheets, the Blithe Abalone, these egg masks, the Agatha rose hydrogels, the Blossom Jeju 2 part masks, although I'm now changing that to six, because the Charlotte Tilbury dry masks are competing for top spot! (I did an indepth demo here if you fancy more info). 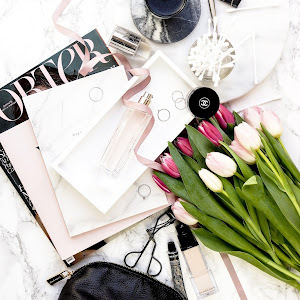 As far as masks out of a tube or jar go, I really enjoy Darphin's Camellia and Kiwi masks, and the No7 hydrating mask, all of which are pretty affordable. As much as I don't need them, I'd love to try out of other masks in particular though, so do leave your favourites below! 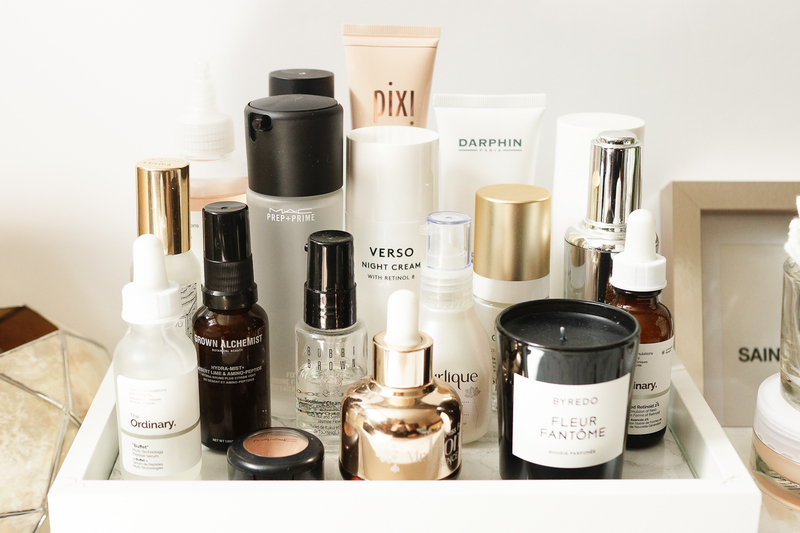 I've been using products that include some form of retinol for around a year, and I think if you're looking to prevent, or slow down anti-aging, they're the only thing you should consider. A bold statement I know perhaps but I'm inclined to believe that vitamin A is really the only ingredient well researched and recommended enough to give you dependable results. The Pestle & Mortar oil, and Sunday Riley's Luna are nigh on identical products, containing the same retinoate suspended in an oil base -I did a full review here if you'd like more info on the comparison and my thoughts. 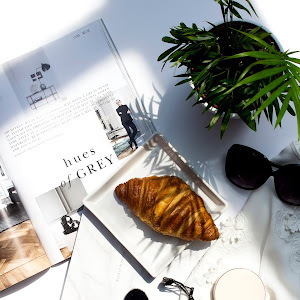 Both Verso's Day and Night creams are huge favourites of mine (if I had to choose, I'd go for the day cream, just because I prefer the texture), they're lightweight, comfortable, and I think my skin doesn't perform as well day to day without them. They're pricey but well worth the money. 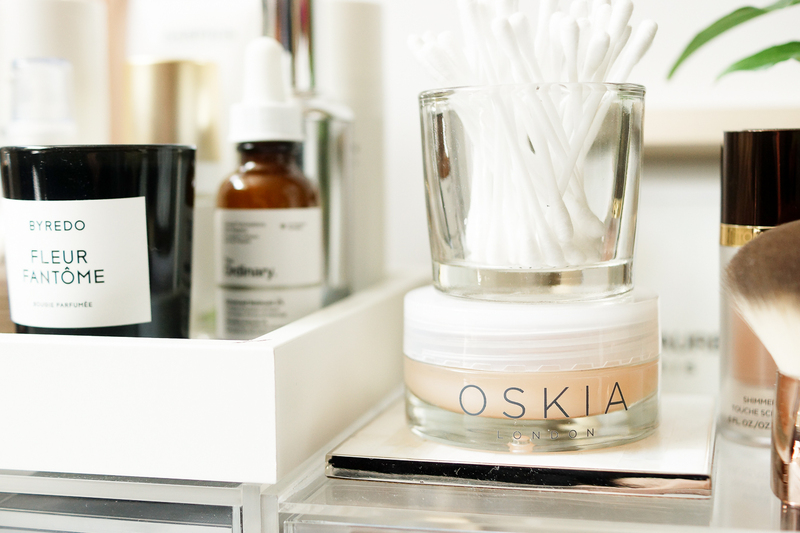 Although saying that, if you're on a budget, definitely give the Ordinary's retinoid a go. It includes the same retinoate as P&M and SR, and has a very similar colour and texture as the Verso night cream. These are all good for my combo skin, and leave no hint of irritation. Otherwise, La Roche Posay, Indeed Labs and Murad have well received retinols that you may want to try. - for pigmentation and tone. If retinols are the only ingredient I trust for anti-aging, then vitamin C is the star of skin tone and fading pigmentation. Way back when, I used Skinceuticals C E Ferulic so sparingly it went off, and now, I pretty much stick to Korean brands as they're so affordable I can use as much as I want, neck, decollete, hands, whatever! The Ciracle serum is my favourite (full review here), followed by the OST C20, although I want to try the Elizavecca powder + serum and Tosowoong powder so they're perhaps next on the list. Also Cosrx (one of my top 7 Korean brands), recently released their vitamin C serum but it's exclusive with Sokoglam - why?! I must admit I don't shop there because they're generally overpriced, but Cosrx + vitamin C might just be too tempting..
- for targeted skincare concerns. 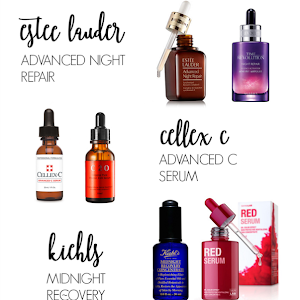 Now that we've covered retinols and vitamin C, many of which arrive in serum form, this category is reserved for other serums, to address specific skincare concerns. Hydration (or lack of), brightening, skin or barrier strength, blemish control, whatever it is that your skin needs, I'd pick one to three serums to add to your collection to address those needs. For hydration, I'd go with something that includes B5, specifically the Ciracle one (review here) which feels magical on the skin - it's like it has the hydration of a heavy salve or balm, but none of the richness . Similarly the Banila Co Honey essence and Cosrx snail serum are fantastic for hydration and inner glow - they make my skin feel really plump and lovely. 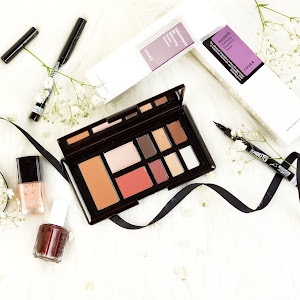 For brightening, I'm loving the Jurlique brightening essence c/o Jurlique, the counterpart to the mist mentioned earlier and it's gorgeous and dewy (with no sparkle). 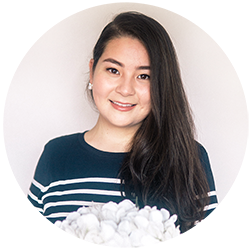 And for good skin health, I'd choose the Swanicoco EGF that you know I love so dearly (more info on that here) and the Ordinary Buffet, which is chok full of peptides so requires plenty of time before you see results. 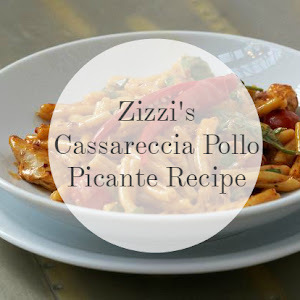 - to keep pores clean, increase cell turnover and maintain the skin's acid mantle. 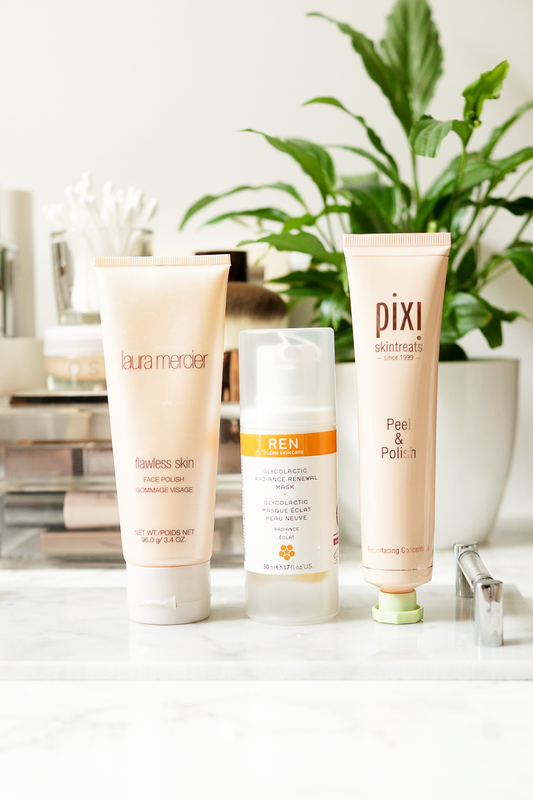 Even though I've already spoken about exfoliators and toners already, I must give a mention to glycolic acid toners, because my skin loves them. I have a bit of a like-dislike (love hate feels too strong) relationship with the Pixi Glow Tonic, but more recently I've tried the Ordinary Glycolic Toning Solution and I think I prefer this one. It does feel a little stronger so I like to go easy with the skincare I apply after using this, and I'll keep it away from the fronts of my cheeks as they're prone to irritation and redness. I'm also going to throw the Cosrx AHA and BHA power liquids (review here) in here too because although not toners, they're very viscous in texture and sink readily into the skin. The AHA liquid in particular is great for overall skin health and appearance, and I can't think it wouldn't be suitable for most skin types. - to nourish and moisturise. Any skin type can use facial oils, including oily. It's my favourite medium for self massage, and I like to apply a very thin layer under a moisturiser at night. Camellia and rosehip oils are my favourite - making the Grown Alchemist one perfect if you can find it. Secret Nature do a 100% pure camellia oil, and Trilogy has a good rosehip oil. I've only recently started trying the Ordinary Marula oil, so hold tight for thoughts on that. I actually don't tend to use many moisturisers, due to the layering in skincare I do, I find that alone is enough. But I've always got a tube of Embryolisse handy, likewise the Grown Alchemist Camellia cream. My guilty pleasure, because I'm supposed to be totally focused on ingredients and not be waylaid by packaging or texture etc, is Chanel. Their Sublimage cream (stealing mum's stuff is the best isn't it?) and the Hydra Beauty gel creme, I love, because they just make my skin feel and look lovely on the surface. I'm also trying a new fun cream from Tosowoong, which is both a gel and a cream, so again, I'll be sharing thoughts on that at a later date! And finally, I couldn't talk about skincare essentials without rounding off with sunscreen. Preventing premature aging, wrinkles, sunspots, hyperpigmentation, skin cancer, it's something I wear everyday in some form (and I'm proud to say I actually do! In fact I used to be the girl that wore Neutrogena's SPF 100 from Amazon before sunscreen formulas vastly improved). My long term favourite SPF is O Hui's Perfect Sun, which they now, rather excitedly, do in powder form. For a combo skin like mine that want a light finish, I'd recommend Earth's Recipe - it's a lovely, light gel that feels like nothing on the skin. A great on-the-go option is the Etude sun cushion, which actually sits really well over makeup - Amorepacific also do a great one. And of course, there are SPF facial mists, the ultimate in convenience, you've really got no excuse but to drench your face in protection. Givenchy do an SPF 30 one, as is Pixi's Sun Mist - in fact as is the Amorepacific one. And if you're watching the pennies, then give the Bioderma one a go, just try not to get it in your hair! This is a super informative post. I am so clueless when it comes to skincare so will have to keep this in mind. Beautiful photography also. Everything about this post is beautiful & perfect. I love a good skincare chat. These are pretty much all of the components in my routine too :) I always have AHAs in there and recently have found some everyday sunscreen formulas I really like and retinols have been a revelation! Love love love! I need all of these products. 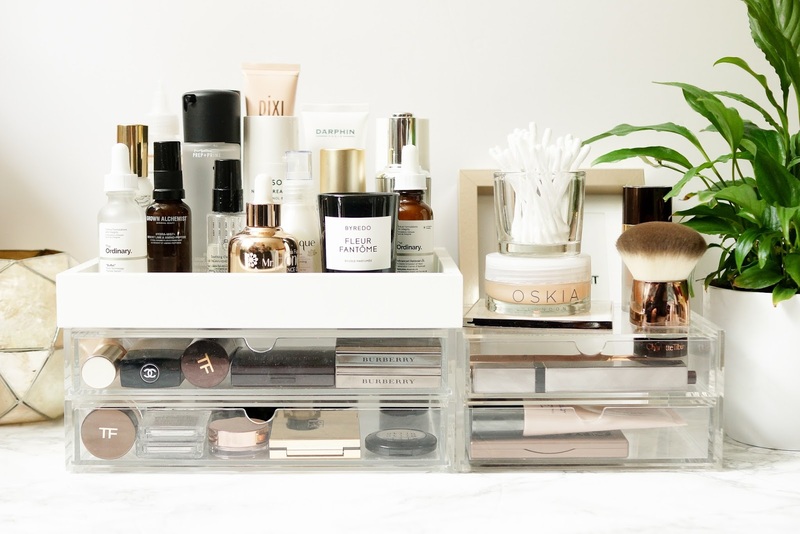 Also, where do you buy your makeup/skincare storage?